CAKE was founded on the belief that our team should strive to provide superior customer service in addition to an innovative product to create an exceptional user experience for our customers. It’s always nice to put a face to a name and meet the people you interact with on a daily basis! We want our customers, prospects and industry advocates to get to know the faces behind the product. Enjoy! 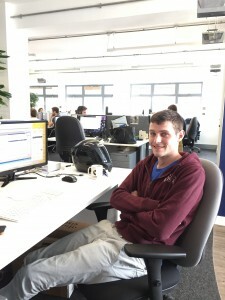 Today we introduce you to Dan Merron, a member of CAKE’s Development and Operations Team, based in the London office. Dan began his CAKE career as a DevOps Engineer in October 2014 after working as a Senior IT Support Engineer for a maritime security company in London. On a day-to-day basis I am responsible for providing and implementing solutions for all product-related inquiries. In the tech world this also means fixing any immediately actionable items whilst monitoring the infrastructure. This can involve tasks such as adding, removing and re-configuring domains. I am also a part of the team who build all of the new CAKE client instances. I love being able to use a wide range of skills in the workplace, and this is something that CAKE allows me to do on a daily basis whilst also learning new things. I am lucky to work in an office full of fun and enthusiastic people, in addition to two other office locations, which makes me enjoy my job even further! Outside of CAKE, I spend my free time with my two children: Ryan and Poppy, they like to visit me at work quite a bit! In my spare time I work on house projects . Most importantly however, I really enjoy simple relaxation. What would you be doing if you were not a MotoGP rider today? When you were younger, what was your favourite bike? Out of all your winning races, which was your favourite Championship? When I was younger, about 14 or 15, I came in first in an off-road endurance race! 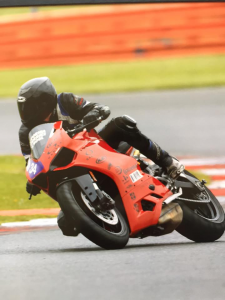 I always take part in track day racing and here is a picture of me in action!